Are you looking for a way to automate the Water Transfer Printing process? You’ve come to the right place. TWN Industries is world renowned for our innovative automated equipment solutions. Our line of automatic activation units takes the human error out of activation. Our systems provide consistency, reliability, and execution when it matters most. Manufacturers all over the world use TWN spray systems to decorate their products. 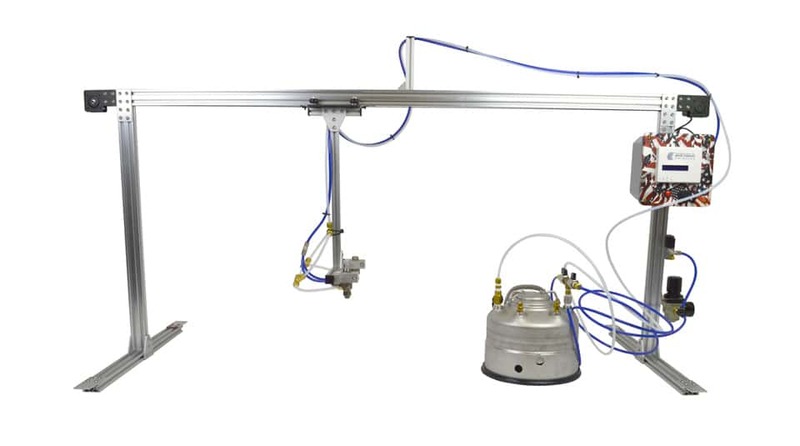 Currently, we have two spray system types: an entry-level system that integrates directly with our 1.2-meter processing tank, and a larger production level system that integrates seamlessly with our stainless-steel hydro dipping tanks. Need a custom activator spray system? We’ve got you covered. Our team will be happy to develop one to meet your unique requirements. Looking to scale your small business? Our 1.2-meter activator spray system is the perfect solution for automating your processing workflow. This automatic push-to-activate™ system integrates seamlessly with our 1.2-meter tank. This is the only truly automated activation system that is affordable for any small business. It drastically reduces overspray, activator waste, redo rates, and improves your overall quality and consistency. Push-to-purge™ – clear activator lines with the push of a button. Push-to-activate™ – trigger activation with the push of a button. Check Out Our 1.2-Meter Spray System in Action! Order Your 1.2-Meter Spray System! Our 1.2-Meter Spray System leads the pack in atomization, efficiency, and affordability. Order your 1.2-Meter Activation System today to start automating your process and improving your decorating capabilities! Our Automated Spray System is our latest production-level activation system. We tailored this system to fit snuggly around any of our Stainless-Steel dipping tanks. The system includes a self-standing control box that allows it to fit well in a constrained area. Because we build this spray system in-house, we can modify it to fit around your existing hydrographic tank. One of the main benefits of this system is the reduction of air pollutants. 1 hour of production requires only 1 min of actual spraying time. 3 spray zones can be controlled independently which allows you to process parts that require film that is less than the full length of the tank. 3 seconds to activate 3 square meters of film. 3 independently controlled spray zones allow you to turn off certain zones. Touch screen HMI allows easy configuration of activation parameters. Internal trigger interfaces with production arm. Warning horn prior to movement. Portable control box with 30 ft. cable. 2-days Hands-on Training at our Facility in Princeton, Fl. 2-meter tank: 6 Spray nozzles. 3-meter tank: 9 Spray nozzles. 3.3-meter tank: 10 Spray nozzles. Our Automatic Spray System can be custom built to fit around any existing Water Transfer Printing tank, including tanks not sold by TWN. Our Automated Spray System takes the human element out of the activation process. This system is especially helpful for large meter-wide film projects where getting proper activation requires a tall person to extend over the entire surface area of the tank. This takes the “guess work” out of film activation and streamlines the entire process, saving time and material.